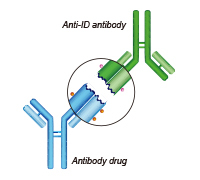 An anti-idiotype antibody (anti-ID Ab, see the schematic diagram) binds to the idiotype of another antibody, usually an antibody drug. 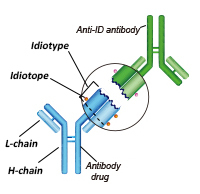 An idiotype can be defined as the specific combination of idiotopes present within an antibodies complement determining regions. 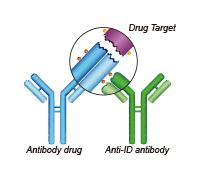 Since anti-ID Abs are capable of binding to antibody drugs within biological fluids, they are commonly used in preclinical setting for antibody drug pharmacokinetics (PK) and pharmacodynamics (PD). 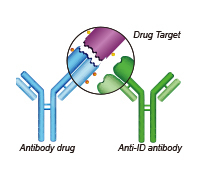 Due to the similarity between anti-ID Abs and anti-drug antibodies, anti-ID Abs are also commonly used as a reference standard for antibody drug immunogenicity, anti-drug antibody (ADA) studies.